This is a family favorite. Its been around forever & its always served at Thanksgiving & Christmas. This amount serves 20ish people a decent spoonful for a side dish or dessert, plus leftovers. Put cranberry sauce into a mesh sieve over a bowl or the sink. Mix a bit so it isn't "can shaped" anymore. Let sit a while (20-30mins) so some of the juices can run off. After the sauce has sat a bit put it into a large bowl. Mix with all remaining ingredients. Cover with plastic wrap & let sit a few hours (overnight) before serving. My grandma likes to add chopped pecans. I leave them out. I also go heavy on the mallows. This recipe has been made by my mom for years. While this is similar to the traditional "green bean casseroles" that most people expect at Thanksgiving & Christmas this is actually NOTHING like the traditional. Its cheesy & yummy. Drain/press barely cooked green beans, very very well. If you HAVE to use canned beans (cause you can't find frozen French cut beans) then still use french cut canned but they don't need to be cooked & they need to be drained even better. Mix soup & old english cheddar very well. Eliminating as many lumps as possible. Add beans to soup/cheese mixture & mix well. Add shredded cheese and about 3/4c of onions. Mix well. Put all into a greased casserole dish. Bake at 350 degrees until cheese is melted & its all starting to bubble which is usually about 30mins. Top casserole with the rest of the fried onions. Put back into the oven & bake until onions are crispy/browned. Allow to sit a few minutes before serving. This year I have a decent sized group coming over and a BIG turkey to roast. So I crock-potted the entire mixture just till it was warm & bubbly, since really the beans are already cooked. The fried onions I toasted on the stove in a non-stick pan and topped the entire crock-pot with the crunchy fried onions before it was time to eat. This recipe IS the original & official recipe from Ruth's Chris Steakhouse. Yes, I am best friends with one of the Executive Chefs wives. Have been for years. Feel privileged. 1 batch serves 2-4 people depending on your sweet tooth. Mix together all of the above & set aside. Mix eggs, sugar & butter well. Add salt & vanilla, mixing well. Add sweet potatoes & beat well. Pour sweet potato mixture into a well buttered baking dish. Sprinkle top with crumb topping. Allow to set for approximately 30 minutes before serving. I'm used to cooking for a crowd, but thank goodness with Kiar I can totally split the work and still get great food. Plus, splitting the work is so much better! So dinner for 13 it is this year. Victoria is going dairy free for a week for scientific research where her migraines are concerned. I'll blog about that separately. I was craving corn chowder...and chowder screams butter & cream. But this recipe turned out SO yummy. I found a recipe online & altered it tremendously for our families liking. We were all super impressed. Served with Italian bread which is also dairy free. Victoria also tried out "Earth Balance soy free natural buttery spread" tonight on her bread, while most of the family still consumed a bit of real butter...except me, I just dipped in my chowda. Saute onion & corn in olive oil. Add halved jalapeno and saute for a few minutes. Add chicken stock & simmer for 10 mins. Add potatoes, celery, almond milk & paprika. Reduce to low...barely a simmer. 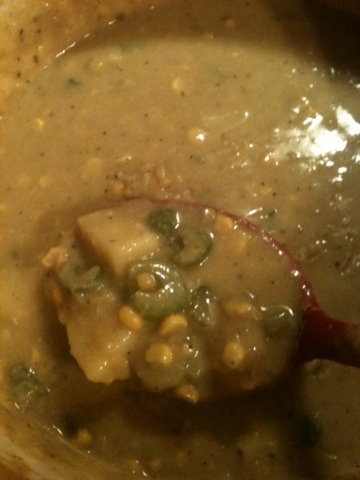 Remove about 4 cups of the solids (potatoes, corn & celery) from the mixture using a slotted spoon. Place the removed items into your blender. Add about 2 cups of the hot liquid to the blender. Blend briefly, then add back to the rest of the soup. Take 1/4 cup of flour & put it into a bowl. Mixing the flour with a few tablespoons of olive oil till it makes a thick "roux". This should be paste-like, not creamy. Using a whisk add the roux paste to the soup & mix well. Set simmer a few more minutes. Serve with bread (dairy free is available). Throw everything into the crockpot & cook on high for at least 4-6hrs. The more meat you are cooking the longer it needs in the crockpot. If you add 2-3 more pounds of meat then add another onion (& another can of chiles if you like them). This is SO easy & yummy it's ridiculous. Take individual tortillas & spread down the middle with refried beans. Using a slotted spoon, spoon the meat onto the burrito & roll it up. Using a ladle, "smother" burrito with some sauce if you like. Its quite possibly the best I've ever had...but I won't ever turn down zucchini bread. Its possible my favorite thing ever. This recipe makes 2 loaves...but I often double the recipe to make 4. I also turn this into muffins. You can also use the batter for pancakes or waffles. Yep, just try it! Mix all of 1st group until fluffy. Add dry to wet & mix. This recipe is about 70 years old. Its amazing. You can barely tell its got oatmeal, since it doesn't turn out like a typical oatmeal cookie. Its also got an amazing secret ingredient. You can see it below. Cream all of 1st group together. Add 3rd group to dough & mix carefully. Spoon into balls onto greased/papered tray. Bake on 3rd rack up. Turn 1/2 way through baking. These turn out fluffy & soft. Almost cakey or like muffin tops. They are SO yummy!!! Combine flour, oats, baking soda, cinnamon and salt. Cream Butter and gradually add sugar, beating until light and fluffy. Add egg, and mix well, then add vanilla. Alternate dry ingredients and pumpkin, mixing well after each addition. Stir in chocolate chips, nuts & raisins. Scoop onto lightly greased cookie sheet. Bake at 30-25 minutes until cookies are firm and lightly browned. NOTE: You can double the recipe if you use canned pumpkin, since you usually have a lot left over. This was a traditional dish around my house growing up. Now we eat it every once in a while at my house. My girls LOVE bacon, but I forget about this option. The girls would eat bacon & breakfast for dinner pretty much every night if they could. So when I remember to make it, this is a great way to use bacon instead of eating breakfast. We eat it as a meal, not a side dish so this makes a pretty big batch. 1 tsp each: Garlic powder, salt, pepper & crushed red pepper flakes. Fluff the cooked rice & put into a large non-stick pot over medium heat. Drizzle with a bit of reserved bacon grease & stir. Add 1/2 of the soy sauce & mix well. Saute onions & celery in a separate pan. Add water chestnuts & bamboo shoots to onions, sauteing for a bit. Add remaining soy sauce to onion mixture & mix. Add all spices to onion mixture. Add onion mixture to rice & mix well. Scramble eggs into the empty onion pan, using bacon grease to cook. When eggs are almost done add the bag of frozen veggies. Mix veggies & scrambled eggs well. Add eggs & veggies to rice & mix well. Finally add bacon to the rice mixture & mix well. Make sure everything is hot & serve immediately. Serves 8 adults for dinner or up to 16 as a side dish. Combine sugar, flour and salt. Stir in pineapple juice and eggs. Cook in a non stick pot, stirring constantly, until thickened. Cool sauce to room temperature. Combine egg mixture and pasta; mix well and refrigerate overnight in an airtight container. Refrigerate in an airtight container until thoroughly chilled. This makes a BIG batch which is perfect for a large crowd/holidays/potlucks, etc. This is the recipe for my friend Jenny's crazy amazing cheese-ball. Don't judge people!!! Squirty cheese has its place in the world and this is it. Especially when its bacon flavored. I typically make a double batch...again no judging, there are 7 of us in the house. The best part of this recipe is squirty out the cheese. Drop into a large piece of saran wrap and shape into a ball. Serve with crackers. Our favorites: Ritz, Wheat Thins & Club Crackers...or celery. My aunt made this (I think) last summer for a family thing. It was so cool & refreshing. I've been making it occasionally ever since. I even door-bell ditched one of my favorite people with this pie for her birthday. Mix cool-whip & yogurt together. Pour yogurt mixture into pie shell & form into a dome shape. Cover carefully with plastic wrap and place in freezer. Freeze overnight or for at least several hours. Defrost enough to slice through (but not fully) before serving. Cut into 8 slices & enjoy. This is an amazing treat in the heat of summer. You can also substitute another flavor yogurt & another fruit, but anything in the berry family is best. Although banana & chocolate sounds really good at this minute. Cream the crud out of the butter & cream cheese. Add vanilla & cream some more. Add powdered sugar a little bit at a time till it is the consistency you like. Frost your favorite cake or cupcakes or the inside of homemade oreos. I've never had a tried & true homemade coffee cake recipe. I decided to buy a box mix a while back & try it and it was nearly perfect for what I wanted...but of course I needed to tweak it around. This batch makes a big foil roasting pan full. (10x18?) I think I've fed about 24-30 people with this batch below. 3 boxes of Krusteaz Cinnamon Crumb Cake Mix (opened & packages separated). Spray roasting pan with Pam/non-stick cooking spray. Open boxed mixes. Set aside cinnamon packets. Mix cake mixes with water & eggs. In a separate bowl mix the oats & the cinnamon packets. Sprinkle all of cinnamon/oat mixture over the cake mixture. Swirl with a knife using a figure 8 motion. Pour melted butter over the top. Bake at 350 for about 1hr to 1hr10mins (a skewer will come out nearly clean). Let cool a bit, but best eaten while still a bit warm. Put 2 cans of beans, 1/2 of the stock & 1 can of Rotel into blender. Combine blended ingredients, other 1/2 of stock, salsa & 2nd can of Rotel into soup pot. Thicken with corn starch slurry if necessary/wanted. Serve with a scoop of cold sour cream in each bowl. Best served with tortillas or corn bread. This soup is very filling! May be made with chicken stock, but its not vegetarian then. DO NOT drain the beans or chicken. Add all ingredients except sour cream to the pot. Top with chopped cilantro & green onions if you like.